First of all, hello again and apologies for my sporadic posting on here recently. I have now successfully defended my viva and have a few corrections to make but hopefully should be able to post on here a bit more regularly from now on. One paper I read that really impressed me while on my hiatus from the blog was by my old commuting buddy James Gilroy and colleagues. This paper attempted to identify the potential biodiversity and carbon benefits of forest recovering in the Tropical Andes in Colombia, an area full of species found nowhere else many of which are under threat from agricultural conversion. The paper also attempted to look at the cost effectiveness of carbon payments for landowners who converted farmland to forest when compared to different land-use options like cattle farming. I was actually quite surprised by what Gilroy and his team found. 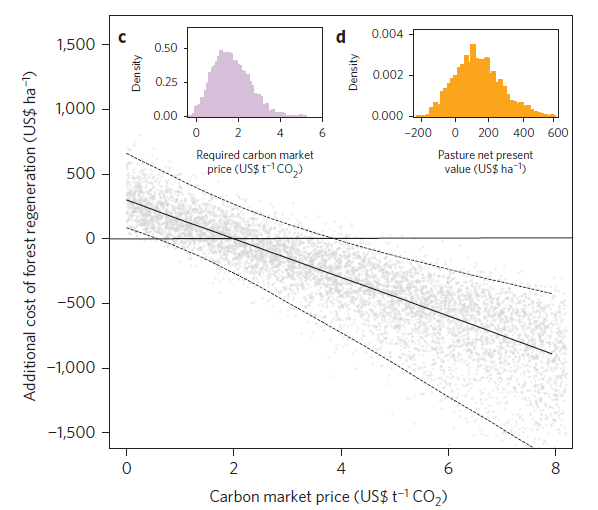 Their results suggested that carbon storage in recovering forests was fairly similar to that in mature forests in the area after around 30 years, much less than the 100 years or so that I estimated these stocks would take to recover in a previous study. 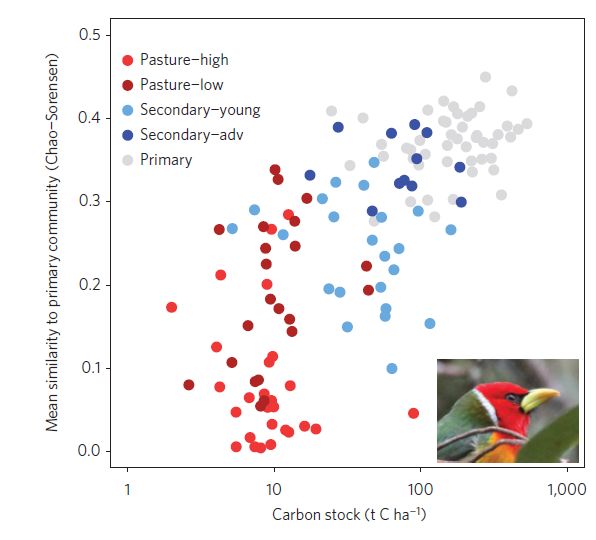 More surprising still was that bird and dung beetle communities in the regenerating forests were fairly similar to those of mature forests, suggesting that they have high conservation value. Again previous studies have generally estimated that animal species that are forest specialists may take a long time to colonise secondary forests, and plants probably take even longer. The fast recovery times may be attributable to the relative closeness of recovering forest to intact forests in the study area, allowing immigration of forest animals and increased likelihood of transportation of seeds from long lived tree species. More important than these findings though was the discovery that if forest regeneration schemes were implemented in the area, they could be more profitable to land-owners than current land-uses like cattle farming. This was true for all pastures in the area when carbon trading prices were greater than $4 per tonne of CO2 and given that the median price of carbon in 2013 was around $7.80 per tonne, paying for the carbon benefits of regeneration in these locations works out cheaply. This is the part that I thought was really neat, because all too often restoration schemes fail to account for the costs and benefits associated with such projects. 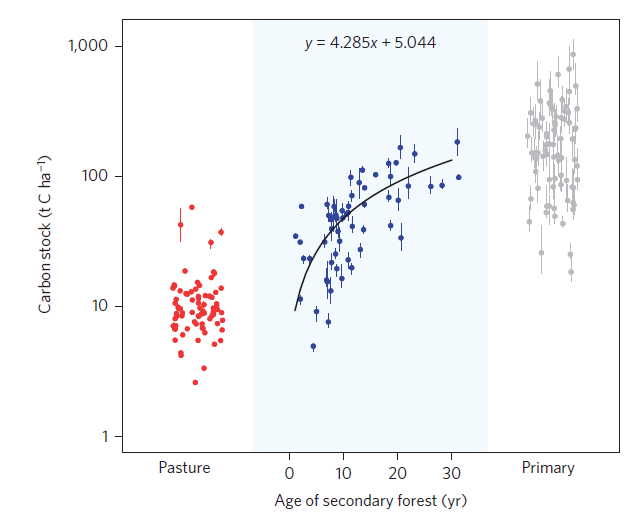 Given that the study area has fairly representative socioeconomic conditions to those found in the wider Colombian Andes, the results suggest that regeneration of cloud forest may provide a great opportunity for REDD+ carbon based conservation, which can deliver multiple environmental benefits at minimal cost. Though REDD+ has its critics it has the potential to transform forest conservation so we need to work hard to make sure it is done in the right way.